A special needs student assaults a teacher. Could anyone have prevented it? When a school resource officer arrived at the assault scene at Beaverton High School on Jan. 11, he found a jumble of tables and chairs flipped over and tossed about in a special education classroom. Staff attended to a 60-year-old teacher near the front of the room. A tall, 18-year-old student sat in the back. Moments earlier, the student, Cianan Nelson, and the teacher, Helen Brown, were arguing about homework when Nelson rushed at Brown and punched her in the neck. The force of the blow tore Brown’s carotid artery and flung her body into the wall behind her. She hit the ground and crawled out of the classroom. A police report shows Brown will likely suffer lifelong injuries from the attack. A grand jury indicted Nelson on felony assault charges. To avoid a jury trial and potential six-year prison stay, Nelson took a plea deal and is currently serving a nine-month sentence at the Washington County Jail. KGW received an anonymous letter about the assault in May. The case was previously unreported. The singular incident sheds light on troubling trends taking place at schools nationwide. Teachers report being assaulted by students at high rates, while special needs students are far more likely to be incarcerated than their peers. Instead of boosting funding for special education programs, school districts often have fewer staff members year after year. Teacher advocates say many public schools don’t provide proper training for teachers, especially those working with kids who have disabilities. Nelson, who has autism, anxiety disorder and attention deficit hyperactivity disorder, says he flipped over furniture and then separated himself from people by moving across the classroom, as he was taught to do when he gets overwhelmed. When Brown stood at the classroom doorway and ordered him to the principal’s office, Nelson says he panicked and rushed at the teacher. After he hit her, he ran to the back of the room and fell to the floor in tears. 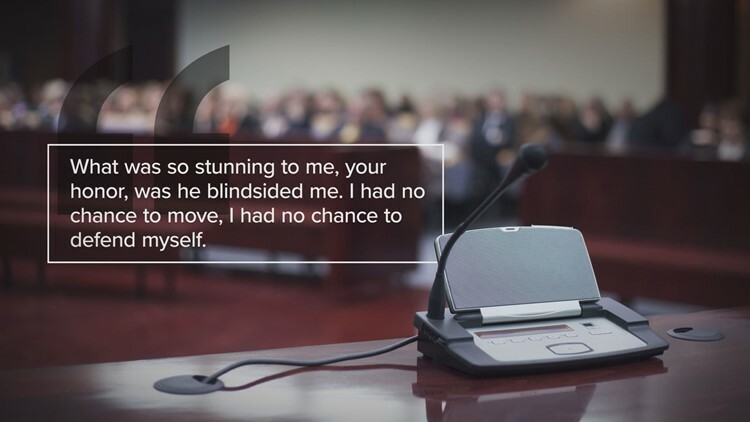 Interviews and documents show Nelson has a history of violent outbursts, but Brown was unaware of key details about her student’s file and diagnosis. The assault at Beaverton High School ended in tragedy for both Brown and Nelson. Could anything have prevented the attack? Cianan Nelson was raised by four doting parents. His biological mother and father split when he was a baby, and both remarried. The two couples purchased homes within walking distance to each other in Beaverton. Nelson’s parents suspected the boy had a disability from an early age. As a baby, Nelson was sensitive to light and sounds. He had tantrums and banged his head against walls. On his first day of kindergarten, Nelson’s stepmother, Pamela Nelson-Gordon, arrived at school to an alarming scene. “The first time I picked him up, he was in the fetal position with his hands over his ears,” she recalled. The family pulled Nelson out of school, put him on medication and worked to integrate him back into the classroom. Then a school psychologist discovered Nelson cowering underneath a lunch table, unable to cope with what seemed like a simple predicament. Nelson’s school file shows he had at least six documented incidents of violently lashing out at teachers or other students in elementary and middle school. Nelson’s parents worked with doctors and psychologists to find medication and coping tools. Nelson had fewer outbursts as he got older. His file shows the last violent incident before he attacked Brown occurred in April 2014, when he was in the 8th grade. Nelson was fighting with a student in gym class when he ran out of the building. A substitute teacher stood in the doorway and told him to come back into the building. Nelson ran at the teacher and punched him. “It was absolutely a panic reaction,” Nelson-Gordon said. Despite his problems, Nelson’s family says he had a happy childhood. He loves reading, math and games. His favorite game is Dungeons and Dragons, which helps him understand how other people feel. At Beaverton High School, Nelson found an ally in the school’s Behavioral Learning Center program and the teacher who ran it. “He was understanding with all his students,” Nelson said. Nelson was on a regimen of Prozac, ADHD treatment Guanfacine, and the anti-psychotic Risperdal. He had an IEP (individualized education program) but attended regular classes and planned to go to community college and become a welder. After Nelson’s junior year, his teacher and the BLC program were transferred out of Beaverton High School. The family and the school district decided to keep Nelson at his school. Nelson was assigned to a program called Resource Room, where a case worker would help him every morning before class. Nelson’s family says the district never contacted them to explain what would be different for their son. 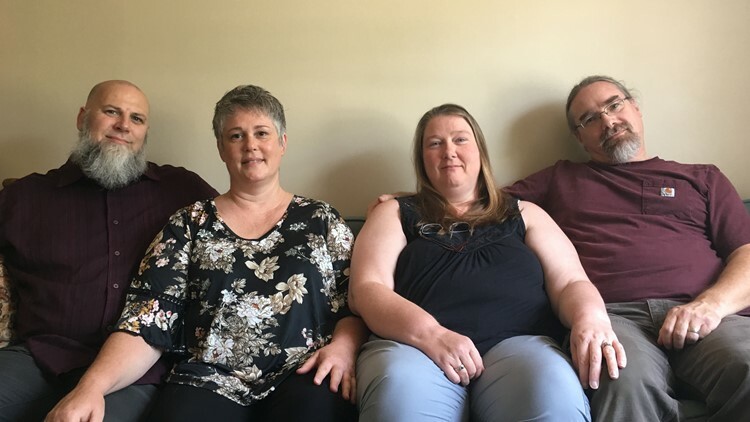 Helen Brown, a Resource Room academic support teacher, wasn’t assigned as his case worker until October, and the family didn't learn about it until early November. By that time, Nelson was failing some classes, skipping school and going to the public library to read. He said he left school because of anxiety. Brown set up a meeting with the family in December. Worried that would be too late to intervene, the family hired a math tutor and hoped they could push through to graduation. Over Christmas break, Nelson’s doctor decided to take him off Risperdal, which can cause dangerously high blood pressure. When Nelson returned to school, he thought he could handle the stress without the drug. That changed on Jan. 11. The second week after Christmas break, Cianan Nelson met with Helen Brown at Resource Room, as he did every morning. Nelson and Brown were alone in the room. Brown asked Nelson if he had his homework, a conversation the two had often now that Nelson was failing classes. Nelson said he tried to explain that he wanted to talk to a teacher about the homework. Brown told him to go to the principal’s office. That went against what Nelson was taught to do when he gets frustrated. According to his school file, Nelson’s coping plan was to go to that classroom and use a “five-minute break strategy” where he takes deep breaths. That’s when Nelson says he snapped. The assistant principal went over to Cianan. Brown answered some written questions through her lawyer but declined an on-camera interview. Her lawyer, attorney Richard Rizk, said Nelson started spewing expletives after Brown asked him to go to the principal’s office. A school resource officer’s bodycam video from the day of the incident shows Cianan realizing he could face assault charges. “People get arrested for this!” He says before burying his head in his hands. Documents show the school determined the attack was a result of Nelson’s disability. In court, Helen Brown argued that Nelson planned the attack. She asked a judge to sentence Nelson to at least a year in jail. Nelson pleaded guilty to a misdemeanor assault charge and a felony attempted assault charge. Deputy District Attorney John Gerhard recommended Nelson be sentenced to 9 months in jail, with the option to eventually expunge the felony from his record. “We took into consideration his age but also the wishes of Helen Brown in the compromise of the plea,” Gerhard said. Brown wrote in email that before the attack, she was unaware of Nelson’s violent past and was not given access to his middle or elementary school files that documented past incidents. She was also unaware Nelson was on medication or had stopped taking an anti-psychotic. Brown is considering suing the district. She says the district didn’t give her enough staff support or training. “Not for students like Cianan, with severe, dangerous behavioral problems,” she wrote. We cannot speak to this particular incident due to student and staff confidentiality protections, however, we acknowledge an incident did occur last school year involving a student and a staff member. When a rare incident like this occurs, we fully investigate internally and, depending on the situation, involve law enforcement. We provide the appropriate internal supports to the individuals. For employees, these may include granting leave from their position, safety planning, etc. Depending on the findings from the investigation, there may also be internal disciplinary action or external action taken by law enforcement. The district said all teachers have access to students’ full K-12 files and medical information. KGW reviewed Nelson’s 685-page Beaverton School District file. The high-school portion from his freshman year through Jan. 11, 2018 shows no mention of his past violent incidents or medication. Several incidents are detailed in the file’s middle and elementary school sections, as is the fact that he was on medication. Nelson’s stepmother says she wishes the school had been more proactive when switching programs for her special-needs son. Special education students in schools are twice as likely to be suspended, expelled and arrested than their peers. It’s a troubling trend the National Council on Disability calls the “school-to-prison pipeline for students with disabilities.” The federal agency says school districts can address the problem by developing early warning systems to identify special needs students at risk of discipline and incarceration. Beaverton School District, which has about 5,000 special education students out of 41,000 students total, would not release statistics on disciplinary action for special education students, as their records are confidential. Teachers are also at risk of violence at the hands of their students. A 2016 national study found that 6 percent of U.S. public school teachers reported being physically attacked by a student in the past year. More teachers may not be reporting assaults. An anonymous survey conducted by the Oregon School Employees Association asked nearly 2,000 teachers and school staff members from 106 Oregon districts whether they had been assaulted at school. Sixty percent said they had, and more than 50 percent said they felt their school was not adequately staffed to protect students and teachers from workplace assaults. There is little data on special education students attacking teachers, but OSEA says they often hear from teachers who were assaulted by students with disabilities. “They don’t want to do anything because by reporting these injuries, they could get that child in trouble,” said Michael Plett, spokesman for OSEA. Between 2006 and 2014, the number of special needs students in Oregon increased by 6 percent. In that same time, the number of special education teachers dropped by 5 percent. “Schools need to invest in staffing to prevent attacks,” Plett said. Helen Brown may not return to teaching. According to her lawyer, she suffers from PTSD and has residual injuries. She says she fears for her safety once Nelson is released. 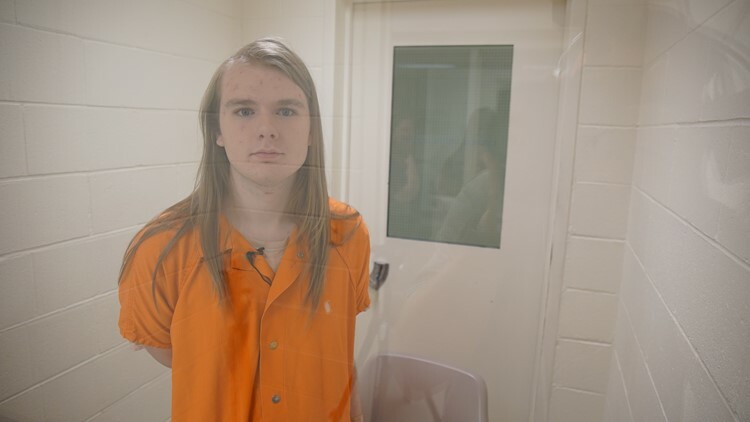 In jail, Nelson stands in his orange prison suit, in a white-walled visitation cell. 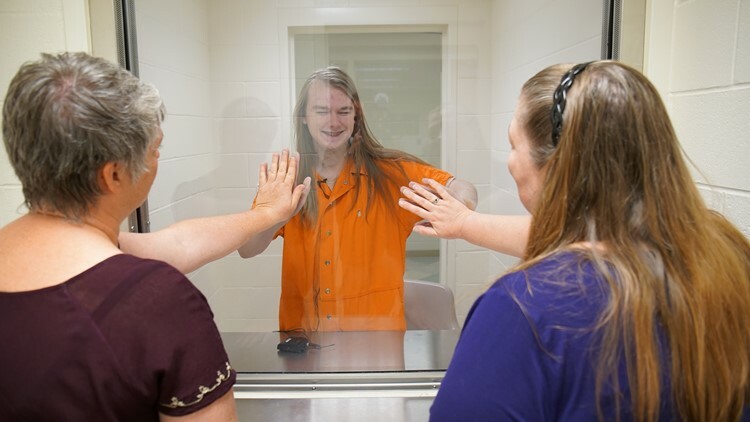 When his mother and stepmother see him, they rush to the glass that separates the visitor side from the prisoner side and press their palms against the window. Nelson presses his hand against theirs, the closest they can get to embracing. Nelson, who is in a jail pod with other people with disabilities, says it’s not as bad as he had feared. He’s read the books in the jail’s library and is in the process of ordering more. He has his own room. His parents visit him weekly and he video chats often with his friends. What he fears for is his future, as a man with disabilities and a record. “I’m more scared of what it’s going to be like after the jail, like what the rest of my life is going to look like with a felony,” he said. In August, Nelson was moved to a correction center across the street from the jail and can work and go to school. He’s hoping to enroll in community college classes this winter. His family plans to support him as much as they can when he’s released. John Tierney contributed to this report.